For the anti-desertification effort in northern China, see Three-North Shelter Forest Program. Satellite photo of the Sahara. The Great Green Wall, or Great Green Wall of the Sahara and the Sahel (French: Grande Muraille Verte pour le Sahara et le Sahel), is Africa's flagship initiative to combat the effects of climatic change and desertification. Led by the African Union, the initiative aims to transform the lives of millions of people by creating a mosaic of green and productive landscapes across North Africa. From the initial idea of a line of trees from east to west bordering the African desert, the vision of a Great Green Wall has evolved into that of a mosaic of interventions addressing the challenges facing the people in the Sahel and the Sahara. As a programming tool for rural development, the overall goal of this partnership is to strengthen regional resilience and natural systems with sound ecosystem management, protection of rural heritage, and improved living conditions. The project is a response to the combined effect of natural resources degradation and drought in rural areas. It is a partnership that supports communities working towards sustainable management and use of forests, rangelands and other natural resources. It seeks to help communities mitigate and adapt to climate change, as well as improve food security. The Sahel’s population is expected to double in 20 years, adding urgency to the project. During an expedition to the Sahara in 1954 Richard St. Barbe Barker proposed a ‘Green front’ to act as a 30 mile deep tree buffer to contain the expanding desert. The idea re-emerged in 2002, at the special summit in N'Djamena, Chad on the occasion of World Day to Combat Desertification and Drought. It was approved by the Conference of Leaders and Heads of States members of the Community of Sahel-Saharan States during their seventh ordinary session held in Ouagadougou on June 1-2, 2005. Lessons learned from the Algerian Green Dam and the Green Wall of China led to an integrated multi-sectoral approach. Originally a tree planting initiative, the project evolved into a development programming tool. In 2007, CHSG directed the project to tackle the social, economic and environmental impacts of land degradation and desertification. Burkina Faso, Djibouti, Eritrea, Ethiopia, Mali, Mauritania, Niger, Nigeria, Senegal, Sudan and Chad thereafter created the Panafrican Agency of the Great Green Wall (PAGGW). A harmonized regional strategy was adopted in September 2012 by the African Ministerial Conference on Environment (AMCEN). According to AMCEN, the Great Green Wall is a flagship program that will contribute to the goal of the United Nations Conference on Sustainable Development, or RIO+20, of "a land degradation neutral world". In 2014, the European Union and the United Nations Food and Agriculture Organization, in collaboration with African and other regional partners, launched the Action Against Desertification program to build on the GGWSSI. Drylands Monitoring Week (2015) assessed the state of dryland measurement and initiated collaboration toward large-scale, comprehensive monitoring. Planning (including choices of vegetation and work with local populations) and plantings/land restoration followed (including in Ethiopia, Senegal, Nigeria and Sudan). The Initiative brings together more than 20 countries, including Algeria, Burkina Faso, Benin, Chad, Cape Verde, Djibouti, Egypt, Ethiopia, Libya, Mali, Mauritania, Niger, Nigeria, Senegal, Somalia, Sudan, the Gambia and Tunisia. The project encompasses the Saharan strip, north and south borders, including Saharan oases and enclaves, such as Cape Verde. The GGWSSI intends to strengthen existing mechanisms (such as Comprehensive African Agricultural Development Program, Environmental Program (CAADP) of NEPAD, regional, sub-regional, and national action programs to combat desertification) to improve their efficiency through synergy and coordination activities. The Regional Harmonised Strategy emphasizes partnerships between stakeholders, integration into existing programs, sharing of lessons learned (especially through South-South cooperation and technology transfer), local participation and ownership of actions and developing more integrated and global planning. Ecosia reports having planted 5,531,042+ trees as of 25 July 2018, mostly in Burkina Faso, though no other source for this can be found. In September 2017, the BBC reported that progress was best in Senegal. As of March 2019, 15% of the wall is complete with significant gains made in Nigeria, Senegal and Ethiopia. In Senegal, over 11 million trees had been planted. Nigeria has restored 12 million acres of degraded land and Ethiopia has reclaimed 37 million acres. ^ a b c Puiu, Tibi (2019-04-03). "More than 20 African countries are planting a 8,000-km-long 'Great Green Wall'". ZME Science. Retrieved 2019-04-16. ^ "The Man of the Trees and the Great Green Wall: A Baha'i's Environmental Legacy for the Ages". Wilmette Institute. Archived from the original on 22 November 2015. ^ Saifi, Merdas; et al. (2015). "The Green Dam in Algeria as a tool to combat desertification". Planet@Risk. Davos: Global Risk Forum. 3 (1): 68–71. ISSN 2296-8172. ^ "14th Ordinary Session of the AMCEN". United Nations Environment Programme. UNEP. Archived from the original on 24 November 2015. Retrieved 24 November 2015. ^ "Report of the ministerial segment held from 12 to 14 September 2012" (PDF). Arusha, United Republic of Tanzania: African Ministerial Conference on the Environment. 14 September 2012. Archived from the original (PDF) on 9 March 2015. ^ "Background". Action Against Desertification. FAO. Archived from the original on 22 November 2015. ^ "Drylands Monitoring Week Establishes Network for Sustainable Management of Drylands". IISD Reporting Service. International Institute for Sustainable Development (IISD). Archived from the original on 22 November 2015. ^ "Background documents". Action Against Desertification. FAO. Archived from the original on 22 November 2015. ^ "The Great Green Wall for the Sahara and the Sahel Initiative". The Global Mechanism. United Nations Convention to Combat Desertification (UNCCD). Archived from the original on 22 November 2015. ^ "Great Green Wall for the Sahara and the Sahel initiative: The African Wall" (PDF). FAO. AU-FAO-GM UNCCD-EU. Archived from the original (PDF) on 21 February 2017. Retrieved 12 March 2017. ^ "Homepage". The Global Mechanism. The Global Mechanism. Retrieved 24 November 2015. ^ "What is Ecosia? - The search engine that plants trees". info.ecosia.org. ^ Martyn-Hemphill, Amelia (2017-09-26). "Why is Africa building a Great Green Wall?". BBC World Hacks. ^ Corbley, McKinley (2019-03-31). "Dozens of Countries Have Been Working to Plant 'Great Green Wall' – and It's Holding Back Poverty". Good News Network. 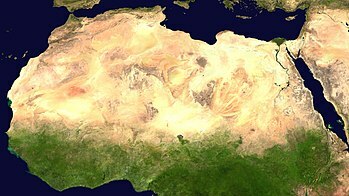 Wikimedia Commons has media related to Great Green Wall of the Sahara and the Sahel Initiative.